Gas bearing lubrication in Turbo equipment has been making slow but steady progress. Almost all fluid film lubrication applications in Turbo equipment use hydrodynamic, (in the case of oil) or aerodynamic (in the case of gas) bearing technology. 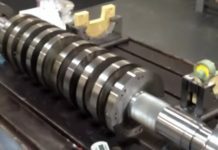 This type of lubrication uses the relative shear between the bearing faces and the rotor to drag lubrication into the natural wedge-shaped gap that forms between them. We have seen the development of spray bar technology and leading-edge groove technology as methods of being sure there is oil at the leading edge of the bearings without having fully flooded bearing compartment. With gas bearings the compartment will always be flooded unless it happens to be a vacuum. 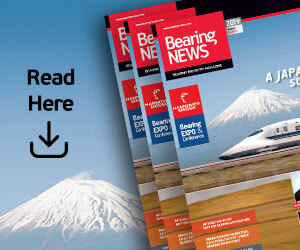 This article will try to detail the main types of gas bearings, where they are used in Turbo equipment and what sort of practical improvements might be made to enable more applications of gas lubrication in Turbo equipment. As mentioned above aerodynamic technology is typical in Turbo equipment. The other type of fluid film bearing is an aerostatic bearing. This bearing creates lift even at zero RPM because it employs an external pressure source and some type of restriction or compensation to create and control a pressurized film of gas to carry the load. 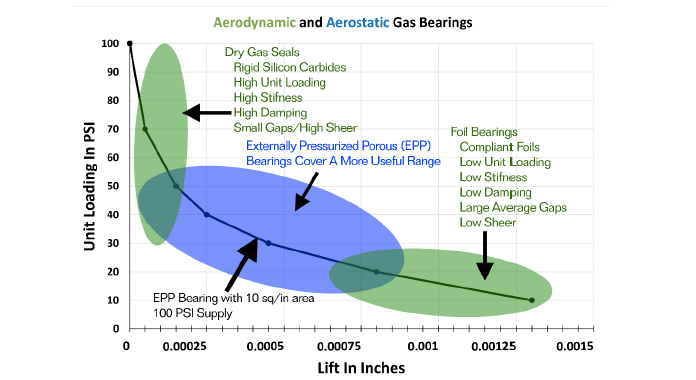 Aerostatic bearings have the advantage of being able to control the bearing gap thickness from outside the machine while it is in operation. But more on that later. Gas bearing lubrication got its start in Turbo equipment ironically, as a seal technology. For most of the 20th century compressors had been built with oil-based seals. Nova, a Canadian pipeline company had enough desire to move away from oil seals to try aerodynamic gas bearing technology as a compressor seal back in the early 60s and John Crane received a patent for the first dry gas seal, using aerodynamic bearing principles in 1963. Dry gas seals are face seals that use fine machine work or etching to create shallow pumping grooves in one of the seal faces. When spinning, these grooves pump gas into the gap from the high-pressure side to increase the pressure of the gas between the faces. These grooves are modified depending on the application for the seal, for instance some grooves may provide for rotation in both directions and another design might be optimized for rotation in one direction. 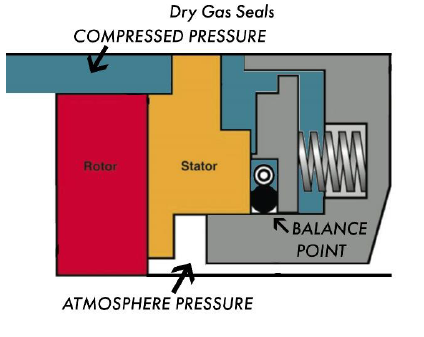 Dry gas seals are also balanced, meaning that the pressure being sealed can come behind the stationary seal face. This means the pressure being sealed is squeezing the two seal faces together. This pressure is also trying to get between the two seal faces and push them apart. The hydrodynamic pumping grooves in the face of the seal create enough extra pressure in the gap to keep the two faces from touching. This is a relatively narrow margin and dependent on conditions like speed and cleanliness, but dry gas seals have virtually replaced all oil seals in new compressor builds. It is interesting to look to the gas lubrication conditions; If there is 2000psi being contained by the seal, then there will be 2000psi of unit loading in the fluid film, as it is squeezing the faces together. The pumping grooves in the seal faces create enough pressure margin to keep a gap between stationary and rotating faces. This gap might be quite thin because the pressure difference from the pumping grooves will not be very high. Shear losses in fluid film lubrication are a cubed function of the gap so very small gaps can generate a lot of shear heat, even in gases. 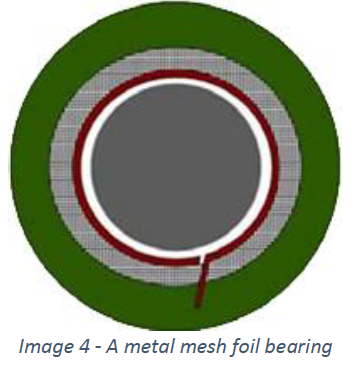 So DGS seal faces are often made from very rigid and thermally stable silicon carbide. The idea is to have stiff and thermally stable surfaces to keep the faces flat even under the high pressures or thermal gradients they see from shear in operation. If the gas gap is only a few microns the relative flatness of the surfaces needs to be and stay, less than the gas gap. Amazingly this is higher unit loading then can be achieved with hydrodynamic oil bearings! So, although dry gas seals still may have some reliability issues they are a dramatic improvement over oil seals and an impressive example of gas bearing lubrication. Foil bearings are another type of gas bearing that employs aerodynamic lubrication principles. They have a long history of operation in military and commercial aircraft as compressor bearings in Air Cycle Machines (ACMs) used to manage cooling, heating and pressurization of the aircraft. The first production ACM using foil gas bearings was designed and developed for the DC-10 in 1969 by Garrett AIResearch. Shortly other companies like Hamilton Standard and Sundstrand were also developing foil gas bearing technology and today virtually every medium to large aircraft flying uses this technology. Foil gas bearings have shown excellent long-term reliability. Many such gas foil compressor bearings have demonstrated operation on working fluids other than air, such as hydrogen, refrigerants, liquid oxygen or supercritical CO2 as examples. The ability to operate at cryogenic or very high temperatures is another advantage of the technology. Not only do gases take the heat better than oil, they do not change their viscosity much relative to oil, this helps keep the rotordynamics simple. Today, foil bearings are also commonly used in blowers for water treatment processes, sub megawatt gas turbines and turbo chargers. 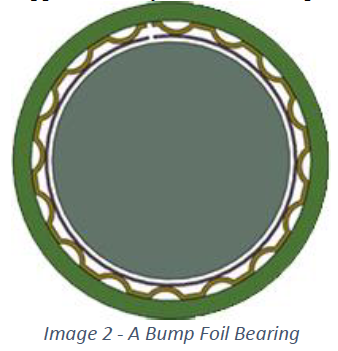 There are many types of foil bearings, most common are the Bump and Overleaf types. The Bump Foil Bearing (BFB) consists basically of a thin flat piece of spring steel that is stamped to have waves that constitute the bumps, it is rolled and inserted into a precision bore. A thin top foil, often with a low friction coating is inserted into the ID of and is supported by the bumps. Generally, only a few thousandths of an inch of radial clearance is designed between the top foil face and the OD of the rotor, since clearances can be a challenge working with stampings and foils, the idea is that the bumps are compliant and as the load goes up, more bumps come in to play, distributing the load across a broad area. The rotor could still whirl or whip inside of the design clearance, so it is not unusual to see BFBs shimmed between the precision bore and the bump strip to reduce the clearance in three or four spots. provide the classic wedge-shaped gas gap and reduce whirl and whip instabilities, but the bending of the leaves produces even less damping than the friction losses in the BFB. It is though, relatively easy to get some preload, that is a bearing inner ID smaller than the shaft OD without shim. 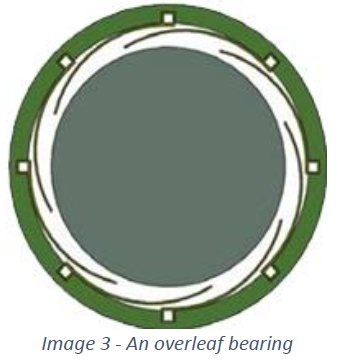 It is also common to see the Overleaf design in thrust bearing applications. A third type of foil bearing, Metal Mesh foil bearings have been attracting a lot of interest and research in recent years. The idea is like the BFB in that there is a continuous top foil, but it is supported by a metal wire mesh, sort of like a sponge rather than bumps. The mesh may be of stainless steel, aluminum or copper. The friction losses between the wires in the mesh as they “spring” is said to result in a damping mechanism that is insensitive even to the high heat levels in gas turbines. 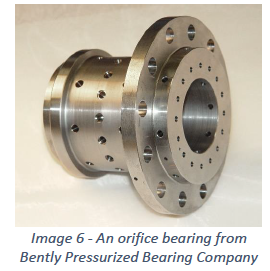 Aerostatic bearings are also called Externally Pressurized gas bearings and can provide lift even at zero RPM. Although they do not have fine pumping grooves like dynamic bearings, they do require some type of restriction for metering the gas into the gap. Air pressure is introduced directly between the bearing surfaces though precision holes, orifices, grooves, steps or porous compensation techniques. It is this process of restriction referred to as compensation that is key but not yet well appreciated in the turbo industries. Compensation enables bearing faces to run very close together without touching, because the closer they get together, the higher the gas pressure between them gets, repelling the faces apart. Under a gas bearing the average pressure in the gap will equal the total load on the bearing divided by the face area. That is the unit loading. So, if the source gas pressure is 100psi and the seal face has 10sq.in. of area and there is 600lbs. of load, there will be an average of 60psi in the bearing gap. Because there is a restrictor of some type just before the gap, if the load increases to 700lbs, the bearing gap reduces, chocking flow in the gap and so the restrictor has less differential and can let the average pressure in the gap increase to 70psi. Out of all the compensation techniques, orifice compensation is the most popular and widely used. This is also the technology Don Bently employed when he started the Bently Pressurized Bearing Co. Yes, after selling Bently Nevada, Don thought he could solve many of the problems he had identified with his eddy current probes by employing aerostatic bearings, but that is another story. 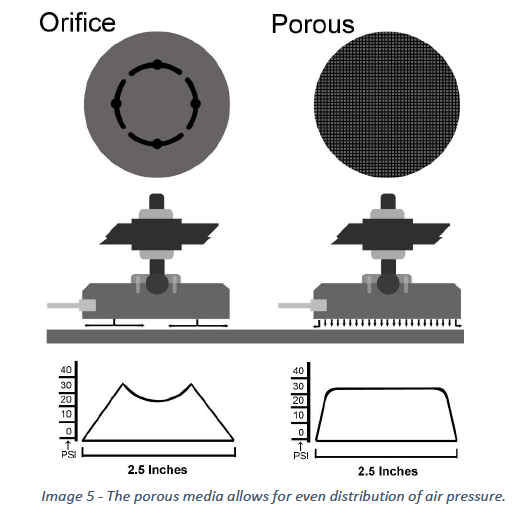 Orifice compensation typically uses precisely sized orifices that are strategically placed on the bearing face and often combined with grooves to distribute the pressurized air across the bearing face. by contamination plugging the orifice and starving the face for pressure and flow. Orifices are typically 0.004 to 0.010 in. (100 to 250 μm) in diameter and so can be readily plugged by Teflon tape or material sloughing off the inside of the tube or some other particulate contamination. Finally, orifice bearings experience collapse at very small gaps. 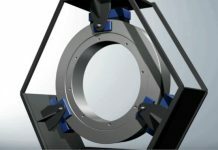 As the face of the bearing gets closer to the guide surface, the inflow around the feed hole becomes choked and is not enough to provide pressure and flow for the rest of the face. The ideal gas bearing design would supply pressure equally across the whole face of the bearing and automatically restrict and dampen the flow of air to the face at the same time. This can be achieved by diffusing air through a porous bearing or seal face, graphite and carbons are naturally porous and may be used for this purpose. The stability of porous media compensation is due to the damping effect from the torturous passageways the gas must flow through to reach the face. This damping effect makes it difficult for the volume of air in the gap to change quickly, resulting in a naturally stable gas film that cannot be plugged by particulates. As even with the supply tubes and/or ports completely full of particulates (sand, dust, etc. ), it still does not create as much restriction as the porous media itself. In the case there is contact, graphite is an excellent plain bearing material. Porous compensation also works well for very small gaps and so small flows, as porous bearings do not experience collapse. With a porous bearing as described earlier with 10sq.in. of area and 100psi supply pressure, the bearing will be in “balanced force mode” with 1000lbs. of load. That is an interesting lubrication regime where there is zero lift and so zero flow but yet zero load and friction between the faces, as the load is taken by the air pressure acting like a hydraulic cylinder. 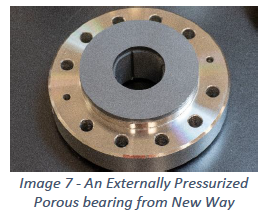 It is not recommended to run a bearing in this mode, but it is another example of why porous compensation has better crash resistance and is more robust then orifice compensation. The accompanying chart helps to conceptualize gas bearing lubrication technology in turbo equipment. It is a lift vs load chart for the Externally Pressurized Porous (EPP) gas bearing scribed above that has 10sq.in. of bearing face, 100psi is fed to the bearing as the load on the bearing is increased. Resulting air gaps are shown on the bottom axis. The slope of the curve around any load point is representative of the film stiffness at that load. 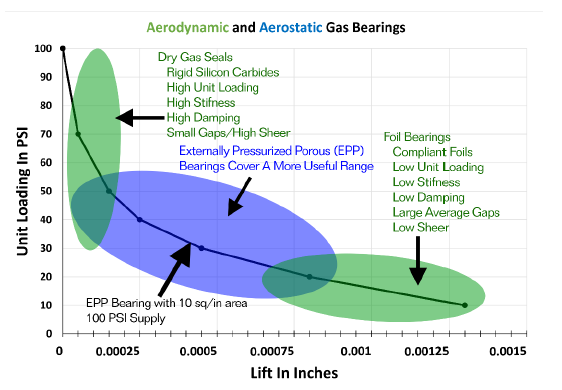 This curve also is similar to curves seen for DGS or eccentricity plots used in rotor dynamics so, the typical operating regions of dry gas seals and foil bearings are superimposed as is the operating area for EPP Bearings. 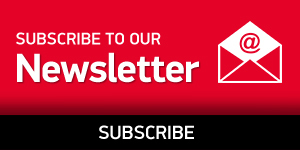 It can be seen that the EPP Bearings operate with a larger gap than dry gas seals, reducing heating and contact issues but still having good load capacity, stiffness, damping and speed capabilities. 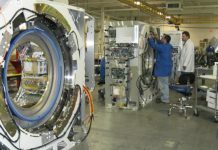 Possibly the biggest advantage is that external pressurization gives an equipment operator a new knob to turn, being able to adjust the bearing or seal from outside the machine. So, if the seal or bearing is running hot, just turn up the source pressure and the gap will increase proportionally with the increased pressure, but shear in the gap will fall on cubed function of the gap. 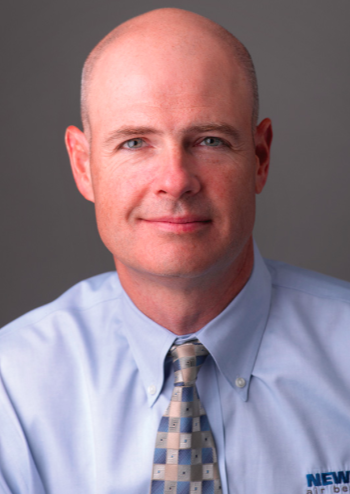 Drew Devitt is CTO of New Way Air Bearings. View more information at newwayairbearings.com. What is a radial air bearing?